Quentin Tarantino returns to our screens with his gonzo Western homage slash anti-slavery revenge movie DJANGO UNCHAINED. It's arguably his best work since PULP FICTION - a movie so tightly drawn, so beautifully produced, so funny, so earnest, so delicately handled. Yes! Delicately handled. There may be the trademark pulpy shootouts, and those archetypal Tarantino tense long-form dialogue scenes, but watch how Tarantino handles the politics of slavery here. It's so deft, so respectful, so bracing, it achieves in the context of a pulp mash-up what no earnest AMISTAD like film could achieve. The first shot of the three hour epic is of Jamie Foxx's whip-scarred back. The camera holds its gaze, forcing us to internalise what slavery really means. It's not the forced silence of Hollywood, only to be occasionally broken by Mammy in GONE WITH THE WIND, or Spielberg's dignified oppressed. It's violent, and sadistic, sweat and blood-stained. Throughout the film, Tarantino shocks us with visions of slaves in hook ringed chains, metal face guards, branding irons and most appallingly, a torture chamber called a hotbox. I don't think any movie has brought us up close to the reality of slavery, and given us, in the form of Christoph Waltz' Dr King Schultz, a liberal almost preternaturally modern pair of eyes through which to view it. Then notice how carefully Tarantino shows us the violence of slavery. When he wants us to see something, he holds the camera on it, preventing us from looking away. But look how carefully he shows us Broomhilda's (Kerry Washington) limp body being wheelbarrowed out of the hotbox. He's very careful to show us the horror without exploitatively showing us her nakedness. Or in another key episode, look at how he shows us the sadistic plantation owner and Mandingo fighting boss Calvin Candie (Leonardo di Caprio) ordering a runaway slave to be torn apart by dogs. We hear the horror, and see it reflected it the faces of the onlookers, and we see fleeting glimpses, but Tarantino is careful not to exploit it. Even in a pivotal later seen, when our conscious, Dr Schultz, remembers it, the powerful imagery is held to a minimum. The film falls into three broad parts. In Act One, we meet Dr Schultz, a bounty hunter with a smooth tongue and a faster trigger-finger, as he meets and frees the slave Django. Waltz is characteristically charismatic, holding our attention as the film's hero, almost to the detriment of Django, at least until the final act. They make a deal - Django will help him as a bounty hunter, and then he'll help Django find and free his beloved Broomhilda. In the second act, the initial bounty has been killed, and we move to a kind of training montage. Django becomes a sharp-shooter, and the two form a bond as Schultz explains the significance of the Siegried-Brunnhilda legend. Our heroes have a run-in with the Clan, that plays like something out of a Coen Brothers movie. For me, this second act was the weakest of the piece. It felt like the film was meandering, and I particularly disliked the stunt casting of Jonah Hill as it brought me out of the film. In the final act, our heroes meet the real anti-hero of the piece, Calvin Candie and his sidekick, the obsequious head house slave Stephen (Samuel L Jackson). This is where the true horror of slavery is exposed, where Di Caprio gets to chew up the scenery, and where righteous anger is unleashed. The structure, revenge motif and complete mastery of DJANGO bears no small resemblance to INGLOURIOUS BASTERDS, but this film feels more tightly written, less meandering and more focussed. There's nothing as memorable or as tense as the initial scene where the Nazi general is sitting in the French farmhouse looking for hidden Jews, or as the bar-room scene where the English spy is given away, but as a complete movie, DJANGO feels superior. I think the courage to show what slavery was, and the restraint in showing it, especially in the context of what is essentially an exploitation-revenge movie, makes DJANGO UNCHAINED a peerless film - certainly one of the finest of Tarantino's career, and easily the most important. But if all that makes it sound too earnest, rest assured that this is also a movie for cinema lovers - full of references to old classics, belly-laugh dialogue and ludicrous shoot-outs. You will enjoy this film, and be educated by stealth - the perfect combination. 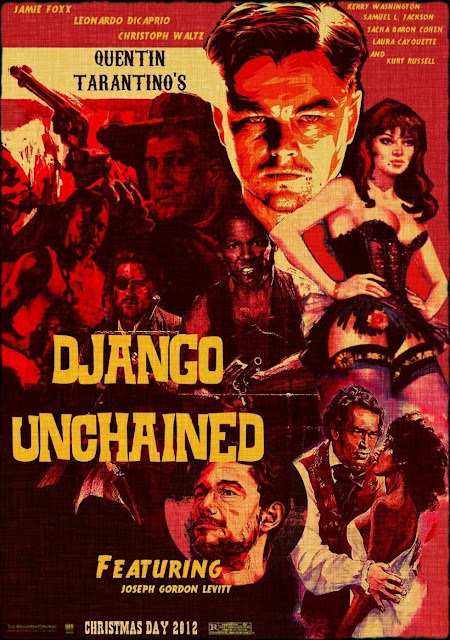 DJANGO UNCHAINED is on release in the USA, Canada, Belgium, France, Chile, Croatia, the Czech Republic, Greece, Hong Kong, Hungary, Israel, Italy, Kuwait, Lebanon, the Netherlands, Macedonia, Russia, Serbia, Slovenia, Ukraine, Albania, Austria, Brazil, Bulgaria, Estonia, Finland, Iceland, Ireland, Mexico, Norway, Poland, Romania, Spain, Sweden and the UK. It opens on January 25th in Australia, Denmark, New Zealand, Portugal, Lithuania and Uruguay. It opens on January 31st in Argentina, on February 27th in Taiwan, on March 1st in Japan, on March 21st in Singapore and in March 29th in India. DJANGO UNCHAINED is rated R in the USA and has a running time of 165 minutes.